Isaac Choate was born 6 November 1875 in Tennessee. 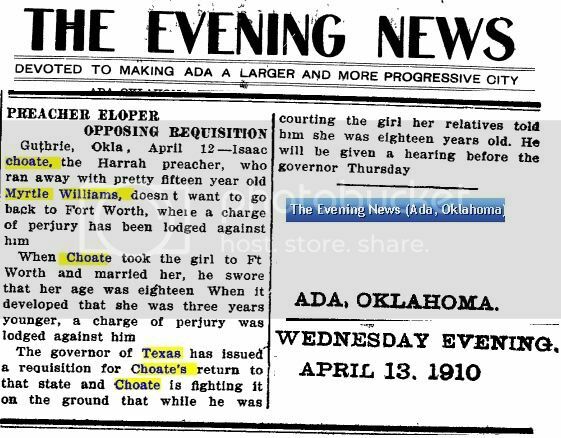 (Son of John Choate and Clarinda Fatima Wells) On 24 March 1910 in Fort Worth, Texas Isaac and Myrtle were married. By 1917 they had moved to Creek, Oklahoma. 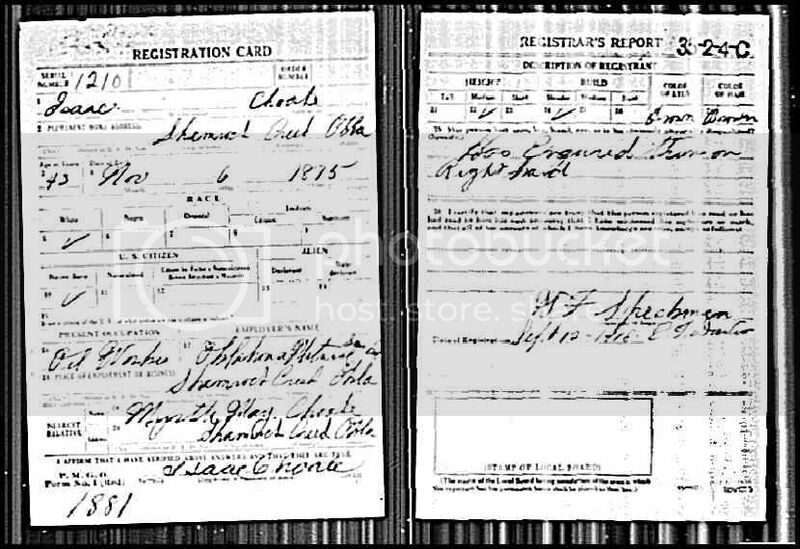 On 12 September 1918 Isaac registered for the WWI draft in Creek, Oklahoma. Isaac was a preacher in Harrah, Oklahoma and sometime before 1960, had moved to the Los Angeles, California area and was a preacher there. Isaac died on 23 December 1960 and is entombed in S204 Del Prado Mausoleum of Inglewood Park Cemetery in Inglewood, California. Myrtle May Williams was born 12 November 1894 at Era, Texas. Daughter of James Matthew Williams and Almeda Annice Billingsley. Myrtle and Isaac were the parents of three daughters. Myrtle died in Los Angeles, California and is entombed in S204 Del Prado Mausoleum of Inglewood Park Cemetery in Inglewood, California. Born 1 March 1911 in Monroe, Le Flore, Oklahoma. Entombed at N829 Del Parado Mausoleum in Inglewood Park Cemetery, Inglewood, California. Lois Choate was born 30 January 1921 in Depew, Oklahoma. Nadine Choate was born 29 September 1924 in Norman, Cleveland, Oklahoma.